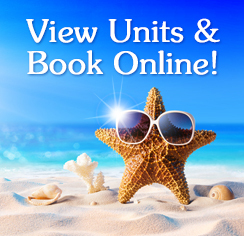 From the moment you set foot on the incredible white-sand beach at Fort Walton’s Waterscape Resort, you’ll know you’ve arrived at a premier vacation destination unlike any other. This beachside condo resort has it all, starting with the 10,000-square-foot split-level courtyard that is the heartbeat of the complex. You could literally spend all day in the courtyard, exploring its tantalizing collection of amenities and enjoying the scenic views of the Gulf of Mexico beyond. Waterscape Resort features two hot tubs in the courtyard for maximum relaxation and three resort-style pools, one with zero entry, plus the Lay-Z-River and 10-foot waterfall. Multiple pool decks, a kids’ pool, and a children’s play area complete with splash pad make it easy for guests of all ages to socialize with their neighbors. In addition, barbecue areas with gas grills are scattered throughout the courtyard for family cookouts. The courtyard pavilion is ideal for parties and get-togethers of all kinds. Just a short walk from the property is the picturesque Fishing Pier and the famous Gulfarium of Fort Walton Beach, which is one of the oldest aquariums in the country. You’ll also find miniature golf and shopping in Fort Walton and neighboring Destin, along with plenty of restaurants serving everything from fresh local seafood to ethnic specialties. And facilities for golfing, deep-sea fishing, scuba diving, snorkeling, sailing, and other water sports are just a short drive away. Learn more about all the fun to be had on a Fort Walton Beach vacation here.